On this balmy and pleasant morning we were privileged to witness the entire Hong Kong and Japanese World Cup squad fine-tuning their team in advance of Saturday’s season finale. In the usual contrasting style of hard work while remaining laid back, most of the horses completed two or even three steady laps of the Meydan main track. This was only the first part of the morning exercise, with again most of them then going to the gates for some match practice, all of which was undertaken with the minimum of fuss. It is a pleasure to watch the calm and professional manner in which these athletes who have travelled thousands of miles in aeroplanes to new, but temporary homes, in strange countries with climates they maybe unaccustomed to, adapt quickly to the conditions and perform at the highest level. These are surely the abilities that differentiate good racehorses from truly great ones. The second set at 7am brings a cluster of Americans, several of which are accompanied by their chaperone ‘ponies’, who are often retired racehorses. The American style of training generally develops them into powerful, hard-knocking individuals and having a chaperone beside them makes for an easier life for the riders. The morning’s eye-catcher for me was without a doubt the stunning looking Roy H. Peter Miller’s charge, who finished a gallant third in last year’s Gulf News Golden Shaheen, looks in even better order this time. He possesses a tremendous physique and proud showmanship that only comes with pure class. He poses as if he knows we are all here just to watch him, and for a few minutes we do just that. “Thank you,” calls out the world-renowned photographer Michele MacDonald, we almost gave a round of applause. Another Golden Shaheen contender demonstrates that winners come in many different guises, Imperial Hint has fairly dragged his pilot around the track each morning, occasionally looking quite out of control. Conserving energy is not in this fellow’s vocabulary. 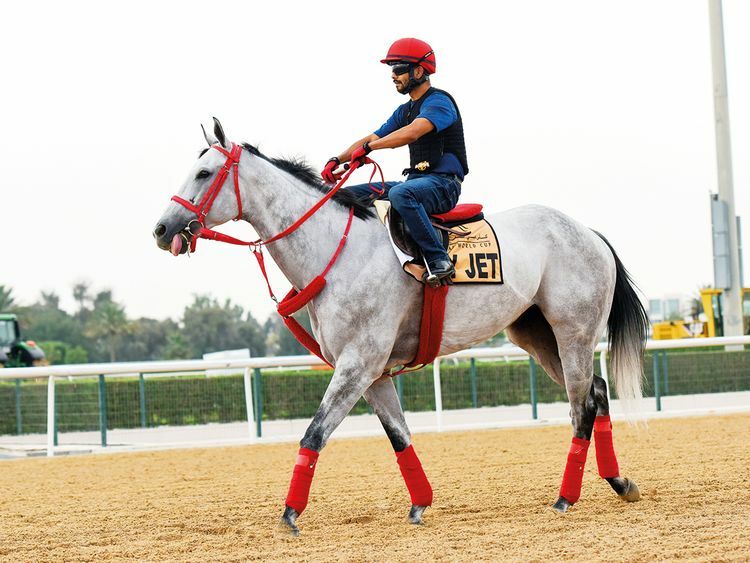 Yet a further Shaheen runner who is training solidly each day is X Y Jet, a handsome grey, sporting lots of red protective leg bandages, he displays the relaxed attitude of someone who has seen it all before. Which he has, including when only a short head second last year to now retired Mind Your Biscuits, whose former trainer, Chad Summers is basking in the opportunity to spend time here in Dubai. The Gulf News Golden Shaheen is building to a fiercely competitive affair.